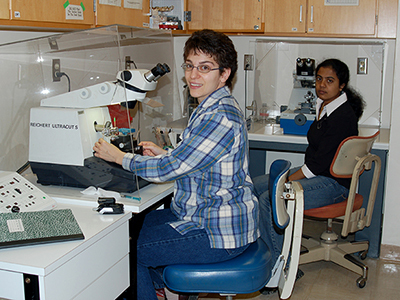 Students Maria Palmeri (left) and Neela Kumar prepare samples using an ultramicrotome. This course provides a foundation in the principles and theories of microscopy with a major emphasis on transmission electron microscopy (TEM) and scanning electron microscopy (SEM). This course is designed to provide a theoretical background for students enrolled in the electron microscopy laboratory courses in the CAMI and for students not needing practical skills in EM but desiring a basis for understanding and evaluating ultrastructural research. This laboratory course integrates the theory and practice of scanning electron microscopy (SEM), including sample preparation, SEM operation, darkroom work, manuscript preparation, and an individualized research project. This course provides hands-on experience from initial SEM specimen preparation, microscope usage and data collection, up to photographic plate preparation for publication. A wide variety of specimen preparation techniques are covered in order to best provide an understanding of the diversity of data collection possible via SEM. In addition to group laboratory sessions, students receive weekly individual instruction in the operation of the SEM. This course provides hands-on experience in TEM specimen preparation, microscope operation, usage and data collection, and photographic plate preparation for publication. A wide variety of specimen preparation techniques are covered in order to illustrate the diversity of data collection possible via TEM. In addition to group laboratory sessions, students receive weekly individual instruction in the operation of the TEM during which they will produce micrographic images for evaluating the various specimen preparation techniques. This course is primarily designed for biological disciplines; however, modifications for material science students are available. Co-Prerequisite: BIO 481/581, permission of instructor. Introductory and advanced training in confocal microscopy is provided on an as needed basis. In order to provide the best training, training is done on a one-on-one basis. If you need training in confocal microscopy contact Dr. Edelmann to arrange training. Introductory and advanced training in light microscopy is provided on an as needed basis. In order to provide the best training, training is done on a one-on-one basis. If you need training in any type of light microscopy contact Dr. Edelmann to arrange training. Students are also able to create an independent course of study for variable credit hours in coordination with a CAMI staff member. Contact with the staff member and planning for the independent study course should be initiated during advance registration for the semester which credit will be received. Specialized personal instruction is also available from Matt l. Duley, and Richard E. Edelmann for computer usage, image analysis, confocal equipment, darkroom facilities, photography, general equipment, and advanced microscopy techniques. Contact them for more information. The Center for Advanced Microscopy & Imaging itself does not have a specific degree program. Students wishing to specialize in microscopy or ultrastructural imaging should pursue degrees (undergraduate or graduate) within specific academic programs at Miami. The Center for Advanced Microscopy and Imaging (CAMI) is an all-university research, teaching, and service facility located in Upham Hall on Miami University's main campus, in Oxford, Ohio. CAMI serves the microscopy needs of both the biological and materials communities.